Hello, sweet sisters and brothers of the world outside. We come to you from the glorious ‘70s, which somehow reside still inside this strange little Internet box of yours. We know that you are looking for style. You want groove and finesse. You want to be adored by everyone… ev-er-y-one… and that this mission is difficult to complete without losing all of your pocket money in one swoop. We are here to give you the skinny so you can get the right gig. But, that is where we are coming from, friends, brothers, sisters, for this exceptional life of swag and chill is for anyone… an-y-one… who has the right grove to their step and smooth to their voice. You will be the one to whom all the kitties run and all the cats want to be if only you know how to walk the walk and talk the talk. Of course, personality is the main factor in being this grand. You need the charisma to appeal to the crowd and the charm to deal with ‘The Man.’ Once you have both, all you need next is to get digs and, then, you’ll be Ace. 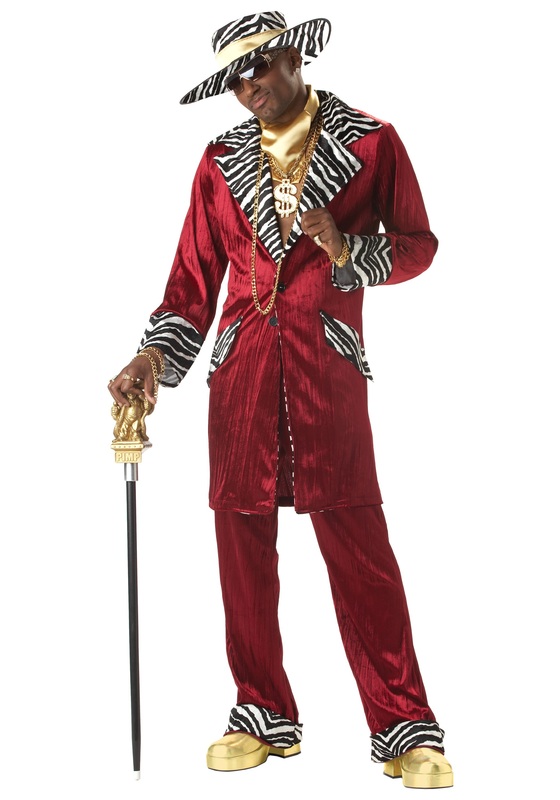 And if you are catching what I’m giving, you know that you need this Sweet Daddy Pimp costume. We’ve got a knee-high jacket that is one part velvet love and one part zebra exotic. It has foam shoulder pads and the widest lapels that can fit on a cat’s bod. The pants match the jacket with the same zebra cuff… but the hat is where the gold is hid. Zebra velour with a wide, flat brim, and gold just hugging your head makes you copasetic and cool. Accessorize with some shades or a cane to show off your bread and you can call yourself Boss!